Among the many different approaches to "templating" with Perl--such as Embperl, Mason, HTML::Template, and hundreds of other lesser known systems--the Template Toolkit is widely recognized as one of the most versatile. Like other templating systems, the Template Toolkit allows programmers to embed Perl code and custom macros into HTML documents in order to create customized documents on the fly. But unlike the others, the Template Toolkit is as facile at producing HTML as it is at producing XML, PDF, or any other output format. And because it has its own simple templating language, templates can be written and edited by people who don't know Perl. In short, the Template Toolkit combines the best features of its competitors, with ease-of-use and flexibility, resulting in a technology that's fast, powerful and extensible, and ideally suited to the production and maintenance of web content and other dynamic document systems. 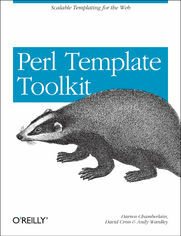 In Perl Template Toolkit you'll find detailed coverage of this increasingly popular technology. Written by core members of the technology's development team, the book guides you through the entire process of installing, configuring, using, and extending the Template Toolkit. It begins with a fast-paced but thorough tutorial on building web content with the Template Toolkit, and then walks you through generating and using data files, particularly with XML. It also provides detailed information on the Template Toolkit's modules, libraries, and tools in addition to a complete reference manual.